You'll discover tucked-away gems like Bagno Eva and Eldorado. Get a sense of the local culture at Abbazia di San Galgano and Cathedral of Santa Maria del Fiore. Venture out of the city with trips to Siena (Torre del Mangia, Siena Cathedral, & more), Pisa (Duomo di Pisa & Battistero) and Viareggio (Bagno Maurizio & Bagno Nido). There's lots more to do: see the interesting displays at Galleria dell'Accademia, admire the masterpieces at Uffizi Galleries, enjoy the sand and surf at La Vela BeachClub, and do a tasting at Guardastelle Vineyard. 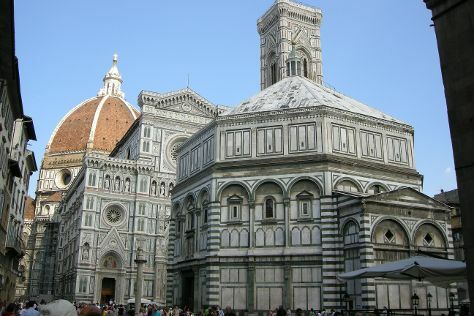 To find maps, reviews, photos, and more tourist information, read Florence day trip app . In July, daily temperatures in Florence can reach 35°C, while at night they dip to 21°C. Finish up your sightseeing early on the 29th (Sun) so you can travel back home.